I have been very busy of late and my studio has become so crowded with paintings in various stages of completion that I have found myself in need of easels. I have two large David Sorg easel, one of them is the one I use for working on paintings each day. The other one has been moved into a different room for when I need to work on oversized paintings. Then there are two French easels, a metal easel and a small desktop easel. Today, I have a 16x20in portrait commission of two horses on the studio easel and several other works in progress are scattered around in my studio that seems to be shrinking on a daily basis thanks to all these big easels. Why so many easels you ask?! Well, paintings go through various stages - sometimes an underpainting has to dry, sometimes they have to be set aside so paint has a chance to dry before the next layer can be applied. Other times an artist just needs a break and a new perspective and needs to work on something else. Some paintings need final varnish applied and sometimes I am just waiting to hear back from a client to approve the finished painting. The clutter of easels in my studio has become insane to say the least and I have started to look into other alternatives. Mainly smaller desktop easels like the one from US Art Supplies. This easel is much smaller than a traditional French easel, which makes it ideal as a desktop easel. A 14x11 in canvas will fit nicely on this easel. The drawer has three compartments ideal for storing brushed or pencils. 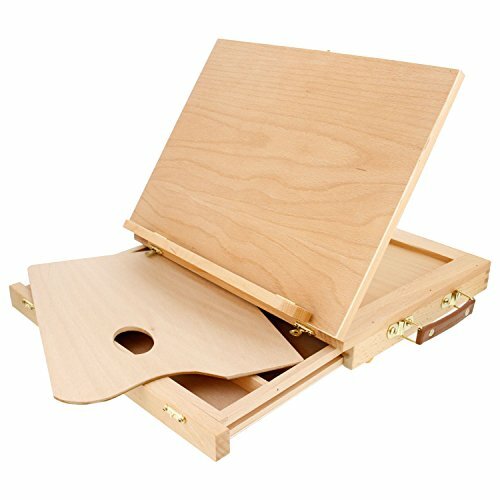 The easel itself measures 13-3/8 width x 10-1/4in deep x 2" high. Latches hold the drawer in place and a handle is attached for easy carrying. There is even a wooden palette included. I like this easel for it's small size and for the fact that it takes up very little room in my already crowded studio space. I received one or more of the products mentioned above for review purposes. Regardless, I only recommend products or services I use personally and believe will be good for my readers. I’m just a regular consumer and I appreciate reading and giving honest feedback about products that regular people like me use on a daily basis or consider buying. My views and opinions are from a customer/end user’s standpoint.